Paul Rudd showed off the new Ant-Man suit on the set of Ant-Man and the Wasp in San Francisco while appearing on HBO's Night of Too Many Stars benefit show. The sequel takes place after the events of Captain America: Civil War and in typical Disney/Marvel fashion, details have been scarce regarding any significant details, but Rudd gave us the best look at the new suit that we have seen thus far. 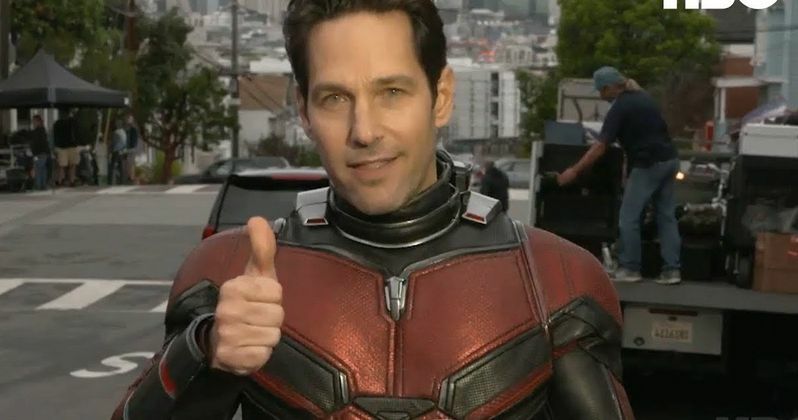 In addition, Paul Rudd confirmed that they change some of the suit details for every movie. While the video does give us a sneak peek into the set of Ant-Man 2 and the new suit, it's also really funny. Rudd sets up the bit as if he's reading fan questions and expecting all of the questions to be Marvel-related, but it quickly becomes evident that all anybody wants to ask the actor about is a particular scene from 2009's I Love You, Man where Rudd's character talks about "slappin' da bass." Paul Rudd reveals that the line was totally improvised on the first question and then becomes angry when all anybody wants to know about is the classic I Love You, Man scene. In Captain America: Civil War, Ant-Man showed off his ability to not only shrink, but also grow into the huge Giant-Man. It's safe to assume that we'll see his giant form in Ant-Man and the Wasp as well. He'll also be helped by the Wasp, aka, Hope van Dyne (Evangeline Lilly), who has assumed the alter-ego's suit from her mother, Janet van Dyne, who is played by Michelle Pfeiffer in the sequel. In the first movie, the younger van Dyne helps Ant-Man, but she'll be fully prepared to fight this time around in her own Wasp suit that once belonged to her mother. Evangeline Lilly revealed late last week that her time on the set has come to a close, but it isn't clear if the entire production has wrapped at this time. Lilly shared a picture via social media on the set of her chair noticeably lower than Michael Douglas and Paul Rudd's chairs with a caption that reads, "I'm going to miss these two. Last day on set." A commenter asked if Lilly was going straight to Avengers now, and Lilly wrote back "Soon." We've known that Evangeline Lilly would be showing up in Avengers 4 for quite some time now, but it's good to know that she'll be suiting up again in the near future. As mentioned before, the Ant-Man suit continues to evolve from the first time we saw it in the first movie. The new modern-looking suit seems to be more tailored to fit Scott Lang, which makes sense because the suit that he wore in the first movie was supposed to be the original suit worn by Hank Pyme when he was still doing missions as the original Ant-Man. While we wait for Ant-Man and the Wasp to hit theaters on July 6th, 2018, check out the new suit in the hilarious video below, courtesy of HBO's YouTube channel.